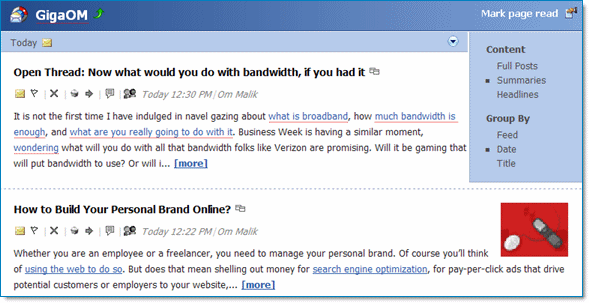 FeedDemon's news bins provide a handy way to save your favorite blog posts and links. When I find an interesting article that I might want to refer to again, I store it in a news bin for future reference. In the past, news bins have been limited by the fact that they're only available on your desktop, but FeedDemon 2.5 makes it possible to share a news bin as an RSS feed. 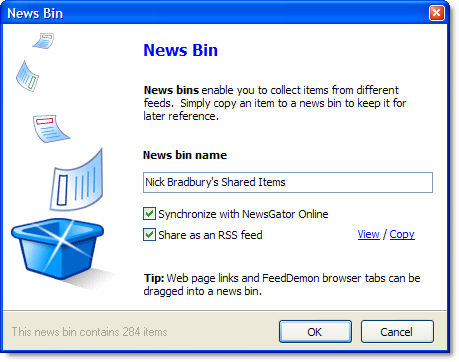 Just drag-and-drop a link into a shared news bin, and everyone subscribed to your news bin's RSS feed will get it. For example, my link blog feed is actually generated from a FeedDemon 2.5 shared news bin. If I read a post that I think will interest my subscribers, I simply add it to a shared news bin. It's like my own version of Robert Scoble's link blog feed (except that with FeedDemon 2.5, I can create more than one link blog). If you'd like easily share your favorite links, then give FeedDemon 2.5 a try. FeedDemon's support for offline reading isn't something every customer uses, but those that need it absolutely love it. And they're going to love FeedDemon 2.5 even more, because it adds a host of new features aimed at making offline reading even better. The most obvious addition is the ability to prefetch unread items. This handy feature - which is found under the "File" menu - downloads web pages and images that are linked in your unread items, making them available even when you're not connected. This is especially nice if you're subscribed to feeds such as Engadget which contain a lot of images. In the past, viewing these feeds offline meant seeing broken red X's where the images were supposed to be, but FeedDemon's prefetching solves this problem. 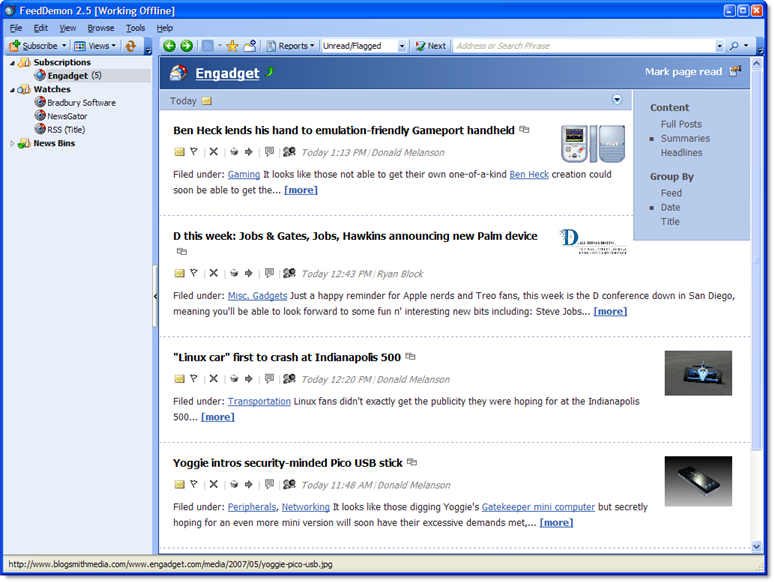 Here's a screenshot which shows how Engadget looks when FeedDemon 2.5 is offline (hint: it looks exactly the same as it does when you're online). In addition to these features, there are a number of smaller improvements that add up to make FeedDemon's offline support far better than it was (and it was already pretty good). If your current feed reader won't work without an Internet connection, why not give FeedDemon 2.5 a try? After months of coding and testing, FeedDemon 2.5 is finally here. As you can see from the release notes, this is a significant update - it really should be called FeedDemon 3.0. I'll be blogging about what's new over the next few days, so for now, just go get it. Simply install it directly on top of v2.x, and all of your existing settings will be retained. Some readers know that I'm a Rush fan, so much so that I even took my five-year-old son to see them a few years back. They're one of the few rock bands I enjoy that I can share with my kids, and I've been waiting for them to tour again so I could take my entire family to see them. So when I found out that they were touring this summer, I grabbed tickets for the four of us. This will be my daughter's first real rock concert, and knowing her, she's going to love it (she already loves YYZ). And get this: earlier today I found out that I won the "Rush Snakes and Arrows Meet and Greet Contest" - which means that my kids will meet the band before the show. A couple months ago, my brother asked me if I'd be willing to sponsor a little league baseball team that he coached. 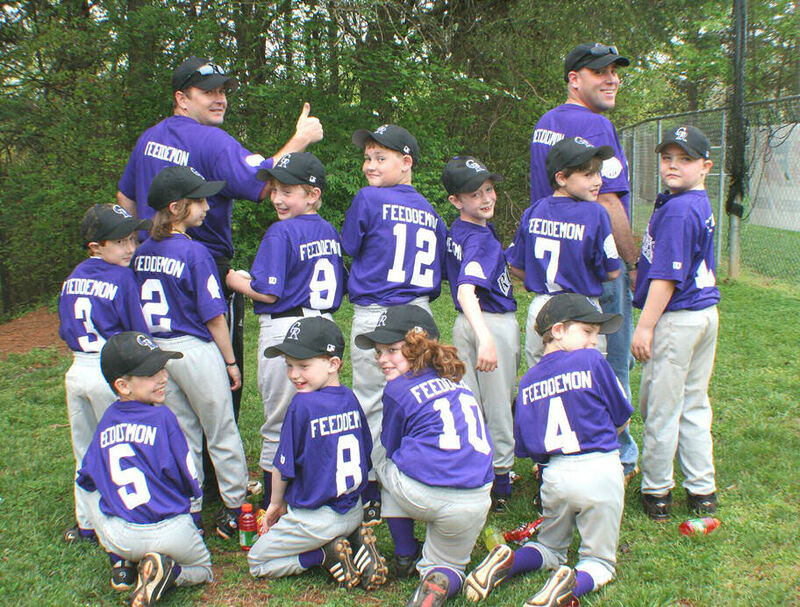 I agreed to do it, provided that he made sure "FeedDemon" was written on their jerseys. When I was a kid, 40 seemed so old. I don't think that 40 is old anymore (far from it), but I'm surprised to find that turning 40 has led me to think about how I want to grow old. That's not easy to think about - but it is easy to think about how I don't want to grow old. A few weeks ago I attended a ritzy charity event, and I swear half the people there - both men and women - had ridiculous stretched faces. They might as well had worn badges that said, "I paid a plastic surgeon a ton of money to look this silly." I sure as hell don't want to get old like that. I also run into people who use age as an excuse not to try something new, and I don't want to get old like that, either. I'm inspired by folks older than me who continue to move forward and challenge themselves. Dave Winer, for example, keeps coming up with great ideas despite being in an industry over-populated with young whipper-snappers. And right now I'm getting a kick out of the fact that Rush - whose members are all in their mid-fifties - just put out one of the best albums of their careers (side note: if you're a Rush fan and don't agree that it's a great album, then you need to listen to it a few more times). I love that the very last line on the album is "We could be down and gone, but we hold on." Not exactly subtle, but still a great closing line. FeedDemon 2.5 RC2 is now available. If all goes well, this will be the last build before v2.5 goes final. I wasn't planning to put out the first release candidate of FeedDemon 2.5 until next week, but a problem with Silverlight needed to be fixed, so RC1 is being released early. If you'd like to get it, please stop by the FeedDemon Beta Site for details.